Remember my little story about that kid of mine who's going to start driving? Well I combined that with a new set of hybrid page frames to save the story. And the results? Mama like. These new page frames come in both 12 x 12 and 8.5 x 11. They come in fully layered PSD files for digital scrapbookers, PNG files, and PDFs for non-Photoshop users to print out and fill in with papers, photos and journaling. For my page, I added a text box into the document, and changed the color of the "Memorable" title before printing it out onto white cardstock. I then printed and cropped photos and patterned paper to fit. I made a page about Cole and baseball using the bonus photo collage file that comes with these packages. Here, I printed out the overlay onto kraft cardstock, then created a separate journaling block to print out and place onto the page. Lastly, I created a photo collage and printed it onto photo paper. In each package, there is a layered collage PSD file that is designed to fit into the upper frame areas. The thing I like most about page frames is they feel a bit like a puzzle to be completed. That's always been one of my favorite things about creating layouts, figuring out how to piece it all together. 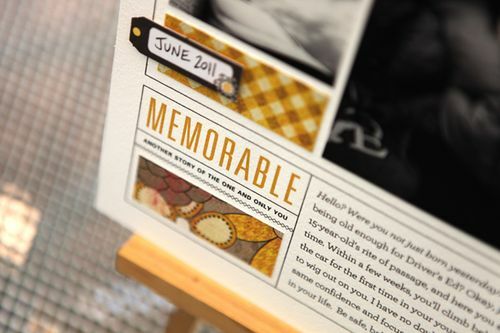 You could also simply break them apart and just use the journaling and title bases to layer into your designs. I will admit: I like the Aidan page more than the Cole page, purely from an aesthetic standpoint. Shhh. Don't tell Cole. It's not personal. It's just design and color. WOW Cathy, these are both amazing. Love the photos on Cole’s page, he looks so at home when he’s at the field. Love the colors on Aidan’s page, so pretty and sweet. Good luck on this new journey with her. Thanks for sharing with us. Love your approach to scrapbooking, Cathy! Awesome pages and kits, must…. have …..! Wishing Aidan all the best with her driving! Oh i love these page overlays Cathy !! gonna put those in my shopping cart @ DD for sure – I love the way you design. : ) Thanks so much, Trisha. Both fantastic pages – are the overlays available for 12 x 12 ie for the one that the photo collage is in? Or can you resize it (total digi newbie)? When you talk about design I am reminded about the DYL course – and the fact that you hinted there would probably be a new course re design over at BPC this year! Any hints yet? AWESOME ok for a sec. cause I’m a dork I almost ALMOST Said what Cathy is talking about me?? (if you look at my blog name you’ll see why LOL) I love these frames I love that I can make them the size that need it SUPER ROCKS! An excellent article to improve people’s quality, enhance the knowledge of the grade, I really like this article, and thank you for sharing. I love these pages! So creative as usual. And I really like how completely different they look and yet are basically the same layout. – That top left-hand photo of Cole reminds me so much of Matthew Broderick in Ferris Buller’s Day Off. Do you see that? So cute! Your templates are my favorites at Designer Digitals! I have a question about changing text on a template like #79 (the one that reads “notes to self”). I noticed that you changed the text on this to go along with the story (i.e., one of yours reads “let some of it go”) but I can’t figure out how to do this. Would you point me in the right direction to find instructions on doing this? Thank you! I kind of do see that! He just saw that movie for the first time and LOVED it. Hey Mary Beth, happy to help. On that template, there is a layer that contains the text notes to self. The font is District Thin, and in the HOW TO PDF, there is a link to let you download the free font. You click on the text layer that contains that type, then click on the Text Tool in the tool palette. Then, you can highlight those words and retype them. You can change the size as well. This particular set of type is clipped into the picture frame, so it achieves the bleed to the edge of the photo effect. You can still clip a photo in as well! Just click on the Photo Layer itself, and then open a photo file, copy and paste into the template, and it should paste right under the type and over the green photo placeholder box!